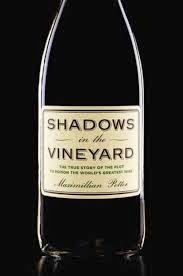 Shadows in the Vineyard by Maxamillian Potter was an interesting tale with the subtitle "The True Story of the Plot to Poison the World's Greatest Wine." The book is about the poisoning and ransom demands put to the famed French vineyard Domaine de la Romanée-Conti and its winemaker Aubert de Villaine. While the book could be interesting to many, it's also an "inside baseball" sort of account of wine, with a ton of compelling to oenophiles material about the industry, famed Burgundy region and Romanée-Conti, a wine so sought after, bottles can go for thousands upon thousands of dollars. In a way the conclusion to the story is a bit of a letdown, but seems more a function of just what the story told is rather than anything wrong done in the writing, and Potter wrote an interesting book that would likely be especially appreciated by wine lovers.